Hypothalamic Hormones is a collection of papers that elucidates the various aspects, chemical properties, effects, and history of hypothalamic hormones. The book is composed of five chapters on the detailed study of hypothalamic hormones. Chapter 1 is about a review of basic and clinical studies of corticotropin releasing factor (CRF); thyrotropin releasing hormone (TRH); prolactin releasing factor; prolactin-release inhibiting factor; factors affecting the release of melanotropin; luteinizing hormone release hormone (LHRH); growth hormone release factor; and somatostatin. The second chapter is a discussion on the various aspects of luteinizing hormone release hormone (LHRH). 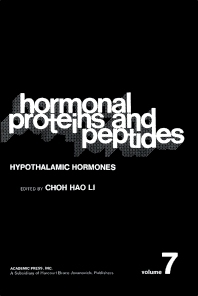 Subsequent chapters are concerned with the study of factors that control the secretion of growth hormone, with particular emphasis on brain neurotransmitters; the mechanism of action of hypothalamic hormones; and effects of androgens, estrogens, and other peripheral hormones on the hypothalamus function. The last chapter gives a history of neurosecretion and neuroendocrinology. Biochemists, physicians, pharmacologists, endocrinologists, researchers, and students in the medical field will find this book invaluable.